" 2. 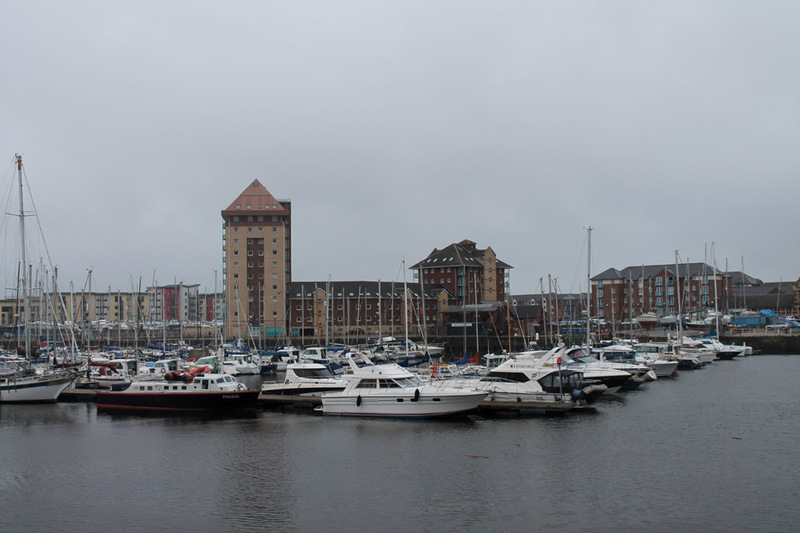 Swansea and West Wales ~ The Marina and SA1Developement~ "
Locations : Swansea City and Docklands. Places visited : Sainsbury's car park (thanks Sainsburys) and then a wonder around. 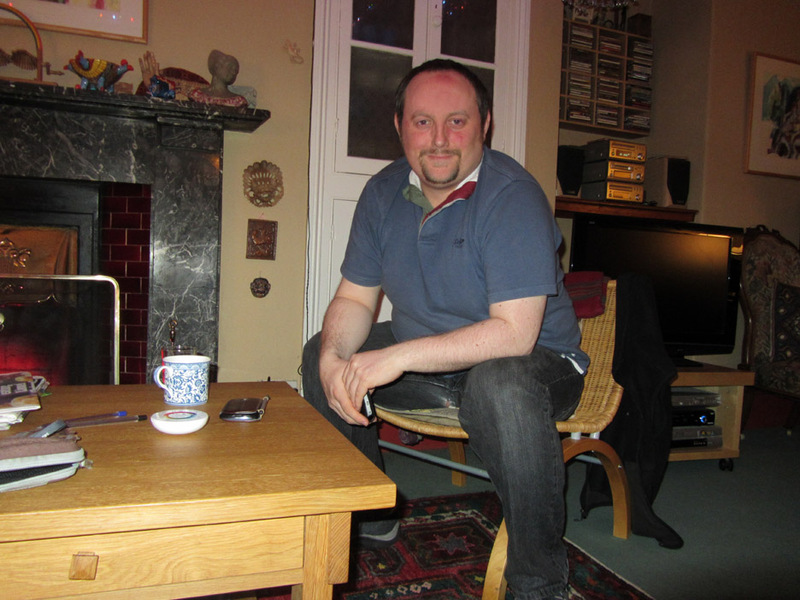 Accommodation : Our friend's house on Mount Pleasant, Swansea. 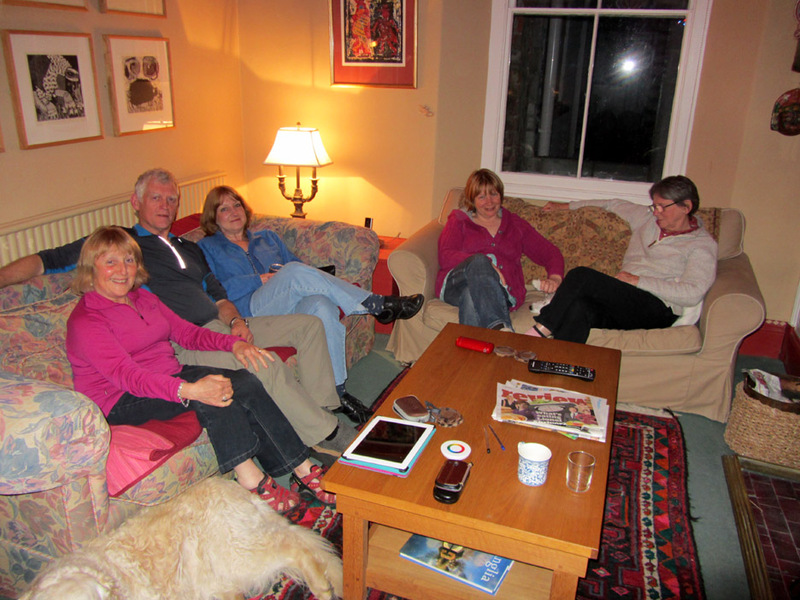 With : Jackie, Jackie's sister Jen, Gareth, Ann and the dogs, Harry and Bethan. 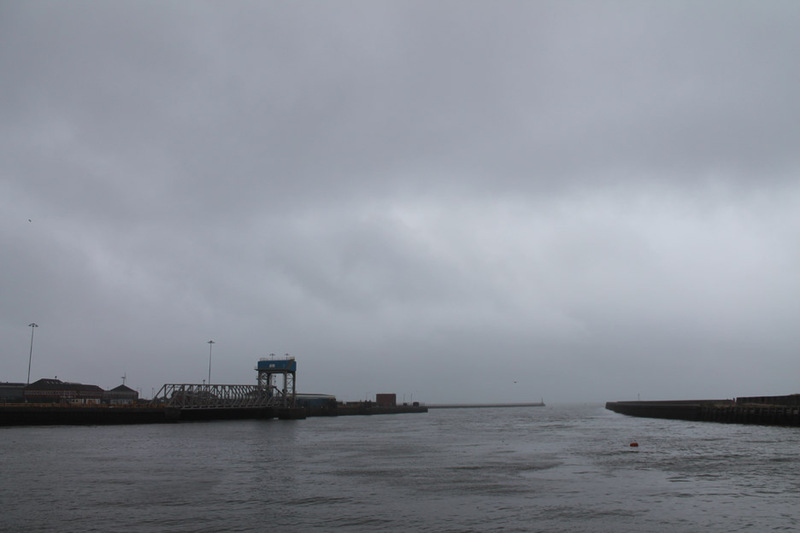 Weather : Sunday dawned without any sun ! . . . well at least it didn't rain till we got back to the car.
" 2. 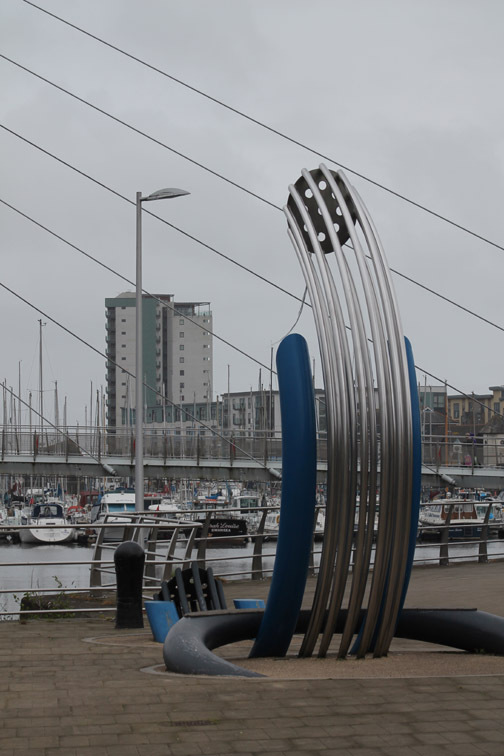 Swansea and West Wales ~ The Marina and SA1"
Swansea is a city built by the sea. 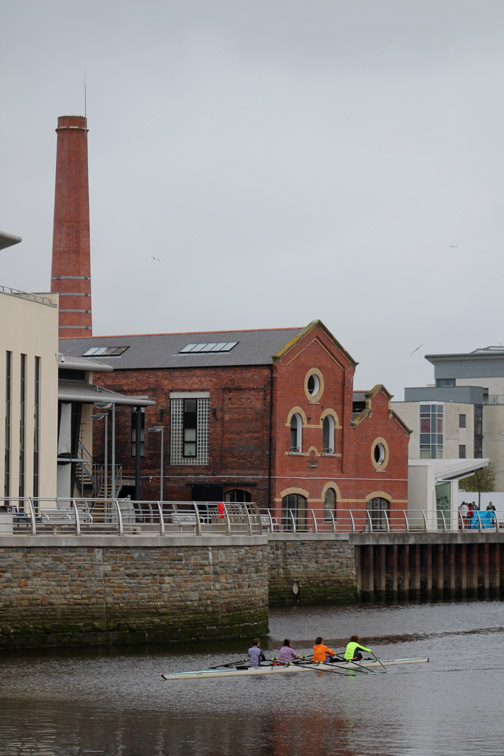 It is Wales's second city and at one time, its major industrial port, importing copper and shipping out coal. The riverside has changed many times since "Sweyne" first settled on his "isle" in the middle of the river and gave the town its name. 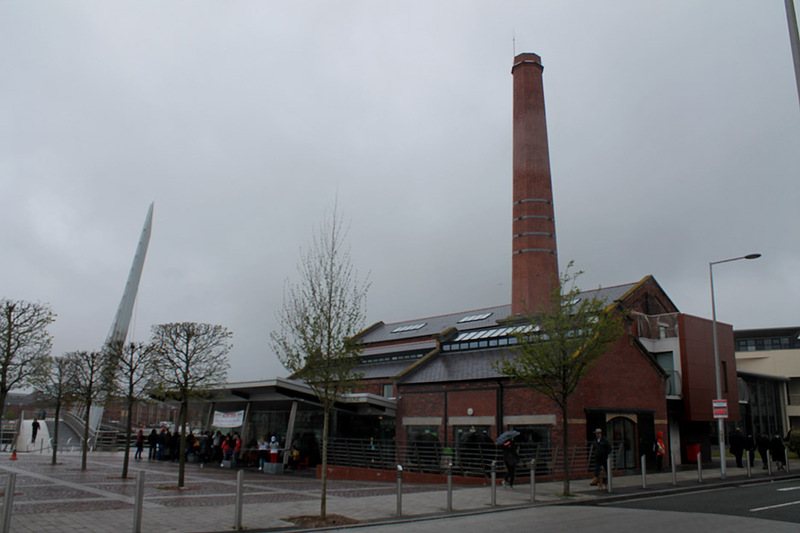 It used to be a centre of heavy industry . 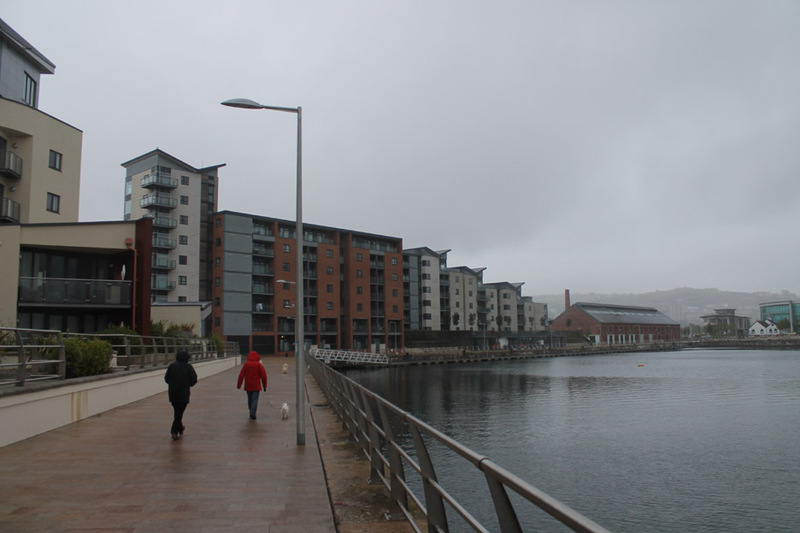 . . now some of the old redundant dockland has been transformed into a leisure and housing area. 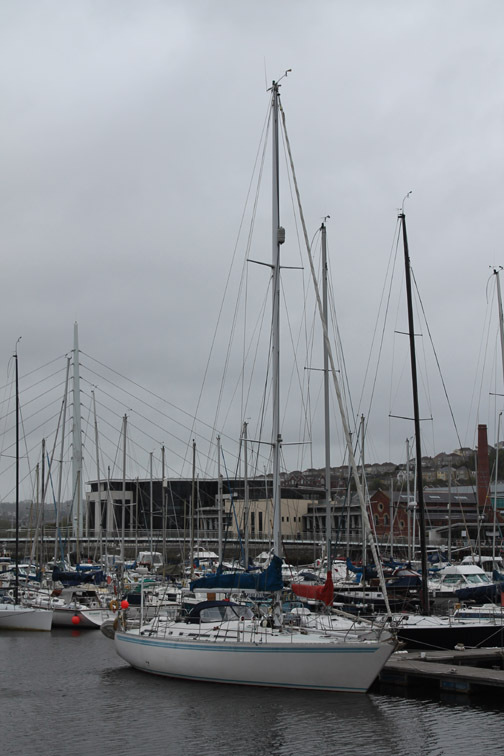 Welcome to "The Marina", latterly called the Swansea's "SA1 Development". 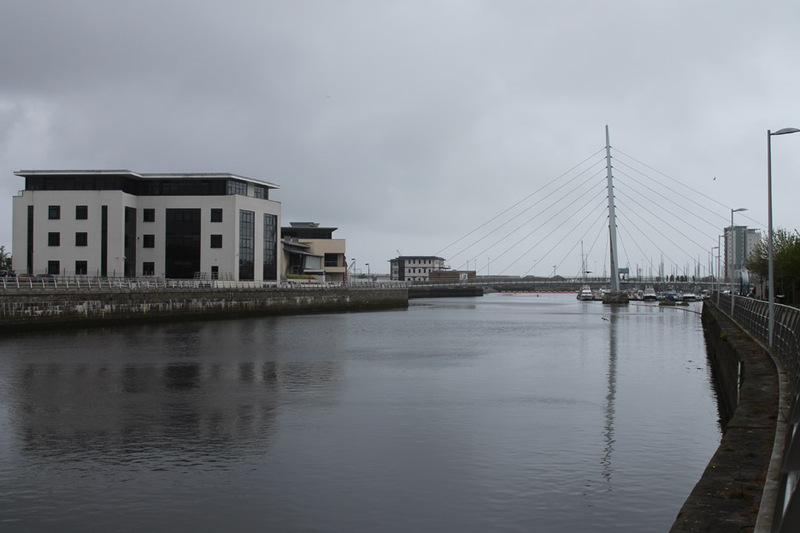 The River Tawe, focal point of lower town. Crossing it has been a major preoccupation of locals and visitors for years. Ooops . . . 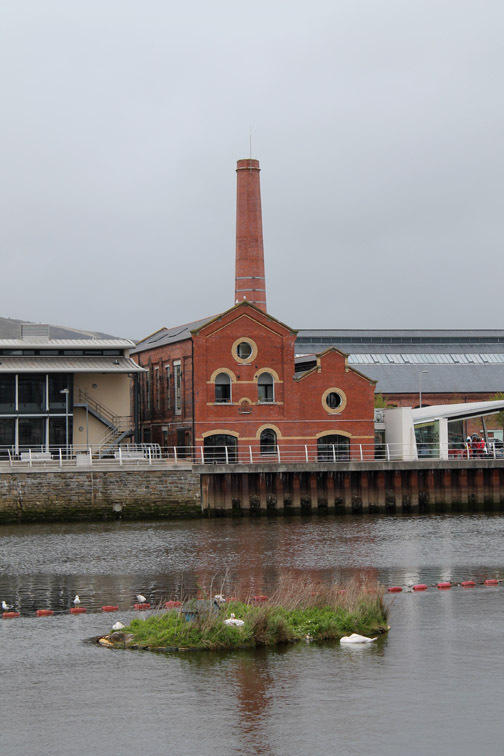 I remember trains going over that old railway bridge and the seeing Weavers building on the edge of the North Dock Basin ! 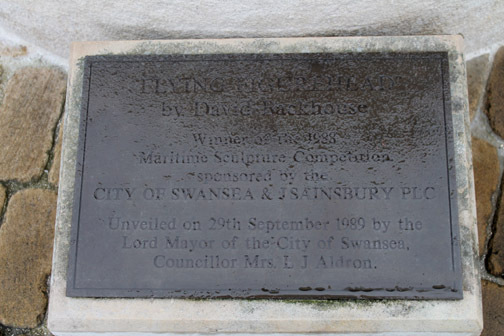 Click here or on the image to see a larger version of this plaque, in order to read the words. Note: the bottom half says the same as the top . . . it is just spelt differently ! Modern redevelopment includes some nice artwork. The old Ice House buildings . . . that used to supply ice to the ships. 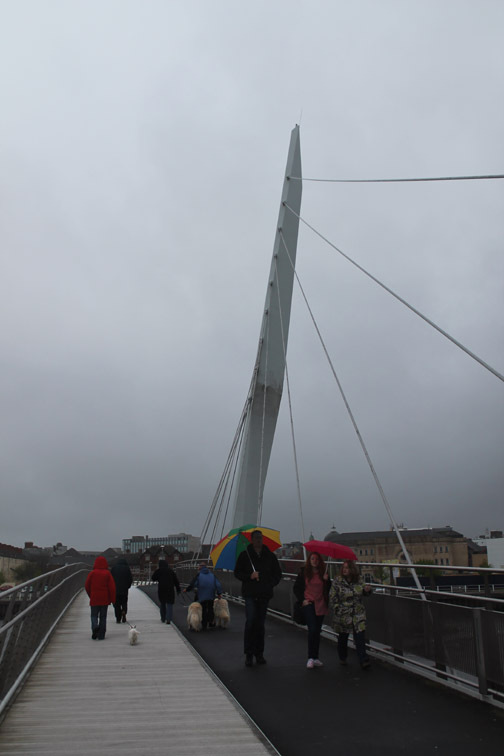 The Sail Bridge . 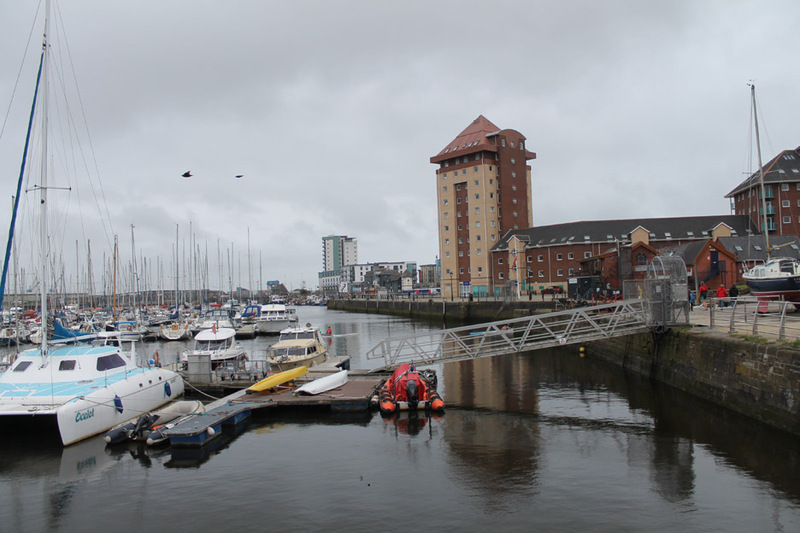 . . linking The Maritime Quarter and the old North Dock Basin area to the SA1 Waterfront on the other side. 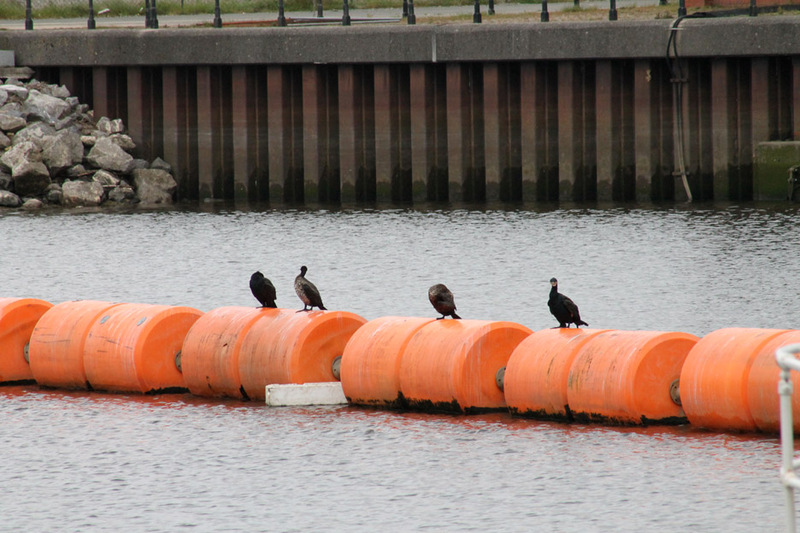 The river is now full of floating pontoons for pleasure craft. 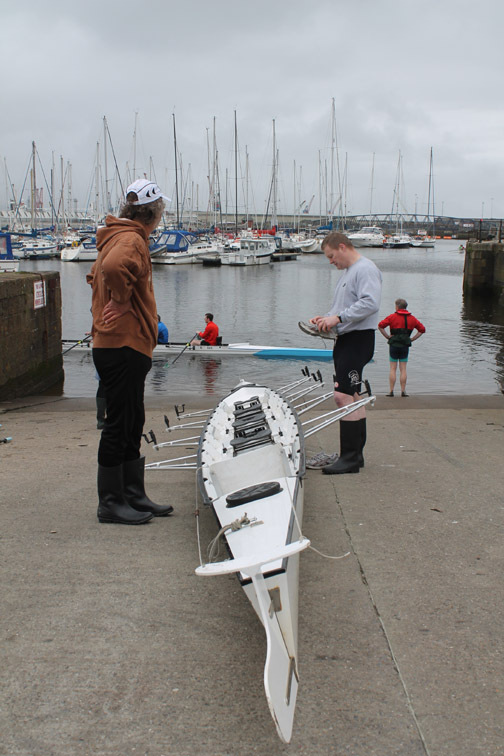 The Swansea Rowing Club are out in force today. An old dry dock within the old South Dock complex. 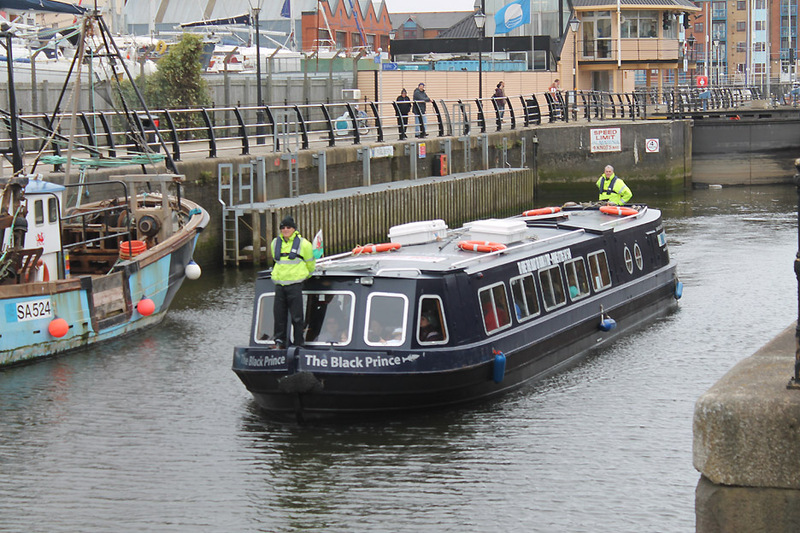 When I was cruiser sailing in Swansea, we used to use this area to moor up our skipper's boat. 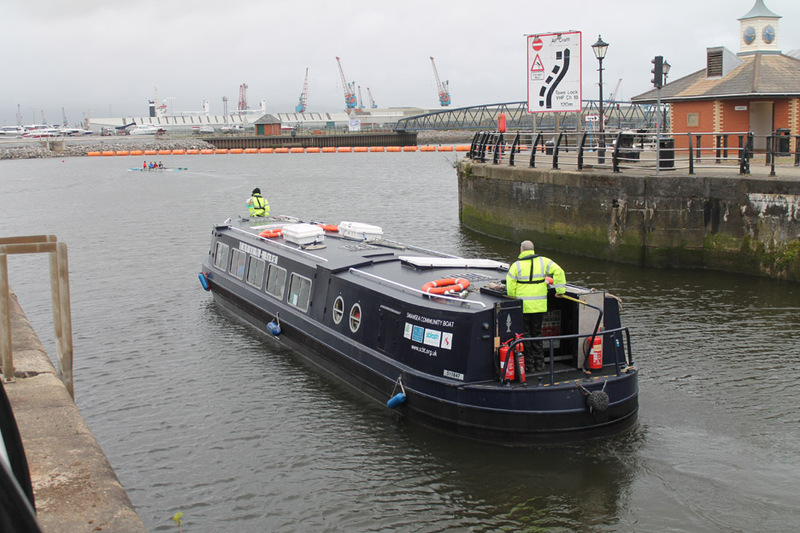 Now, like the river, it is full of pontoons and boats . 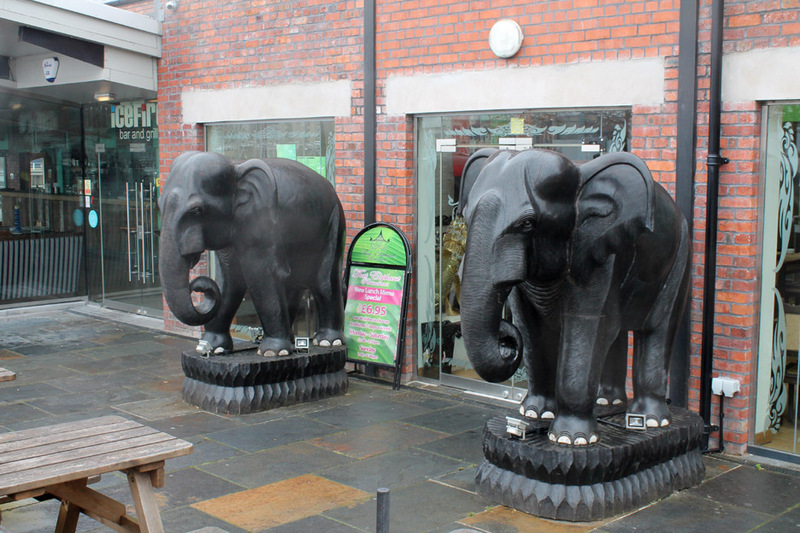 . . what a remarkable expansion of the leisure side of Swansea life. We walk down the river side towards the sea. 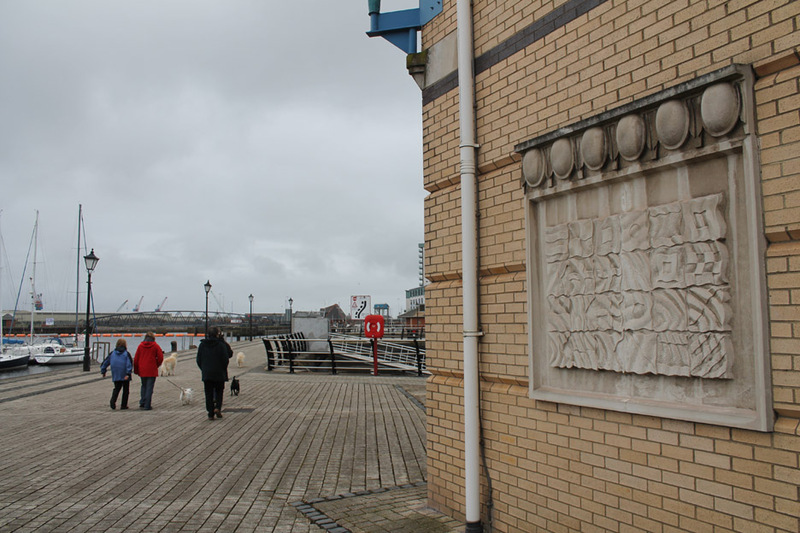 There are lots of artistic panels set into the architecture . . . many like this are interesting but unexplained. 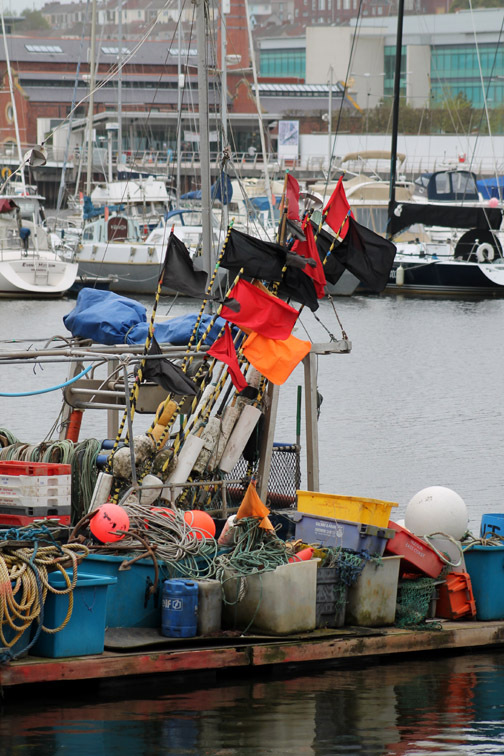 The stone panel, in the photo that you posted with the above caption, are the "International Maritime Signal Flags" carved in stone. 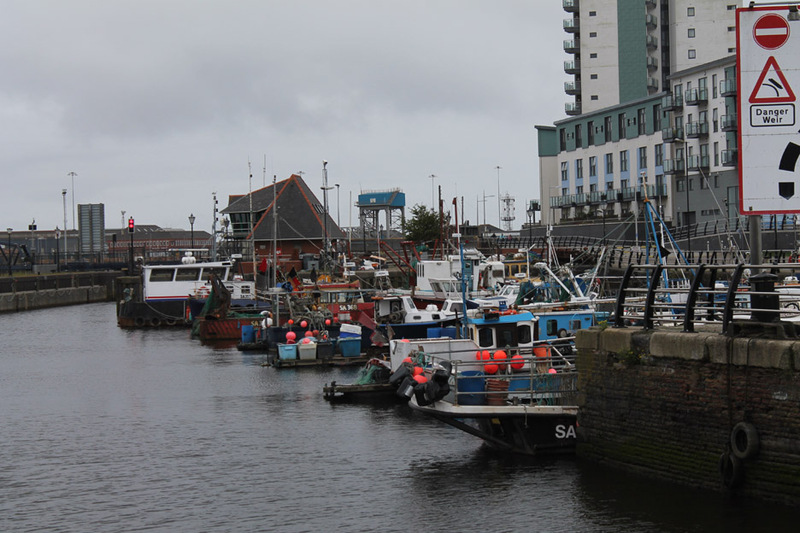 There are now some quite big yachts in the river . . .
. . . but Swansea still has a small inshore fishing fleet. 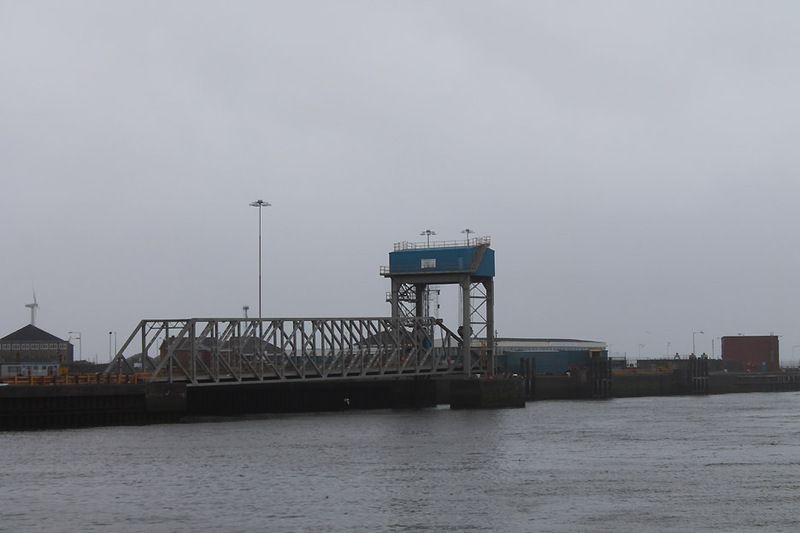 Commercial moorings down by the South Dock entrance. Setting out on a rather grey day for a trip up the river. 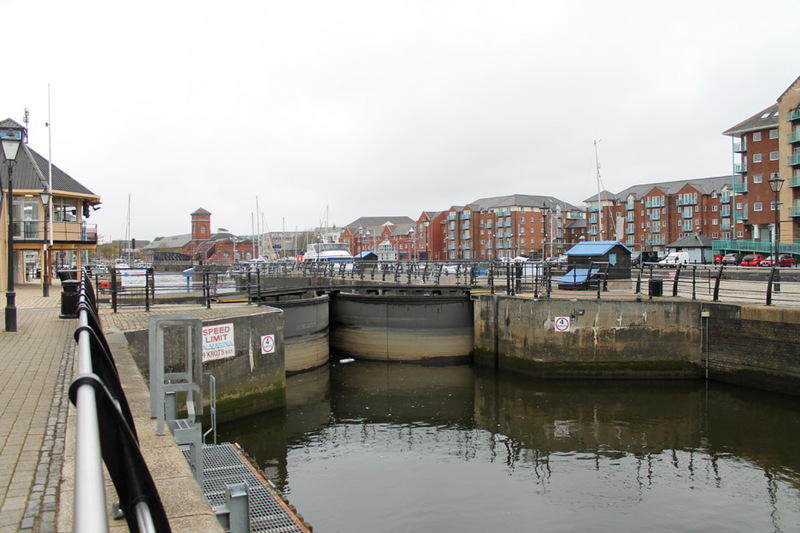 The dock gates to the South Dock Marina. 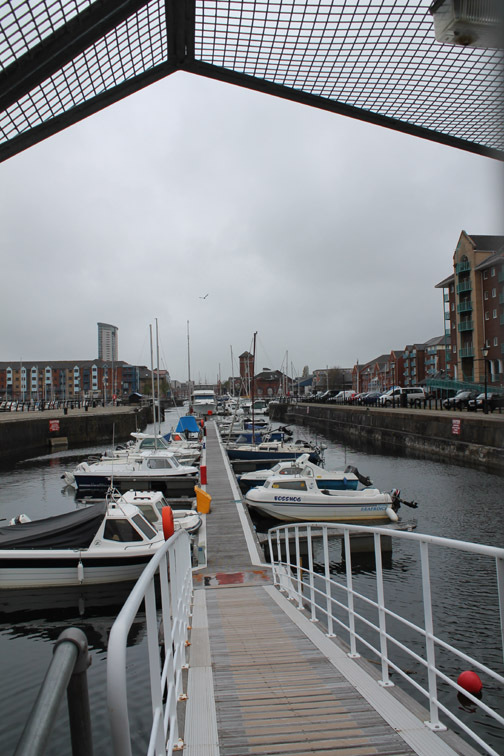 Crossing the narrow bridge over the dock gates was "interesting" for Harry as he hates bridges at the best of times ! 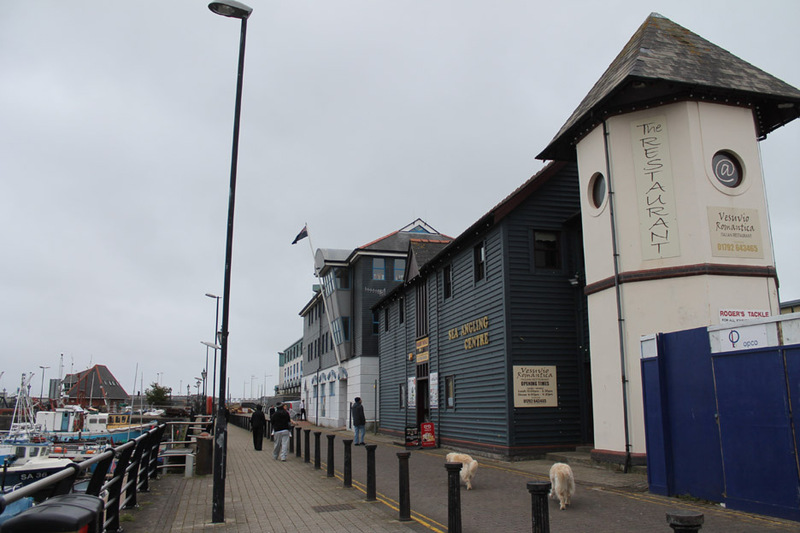 The ground floor is the Sea Angling Center . . . and above is Vesuvio's Restaurant. Do you want to see Roger's Tackle . . . step inside. 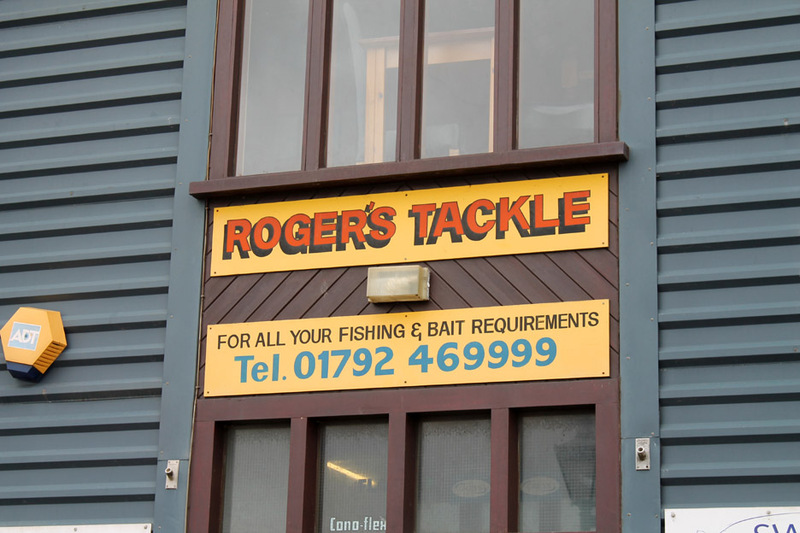 Technically the shop sells fishing gear and is/was owned by Roger Owens, a distant relative of Ann's. allow river moorings and encourage more leisure pursuits. 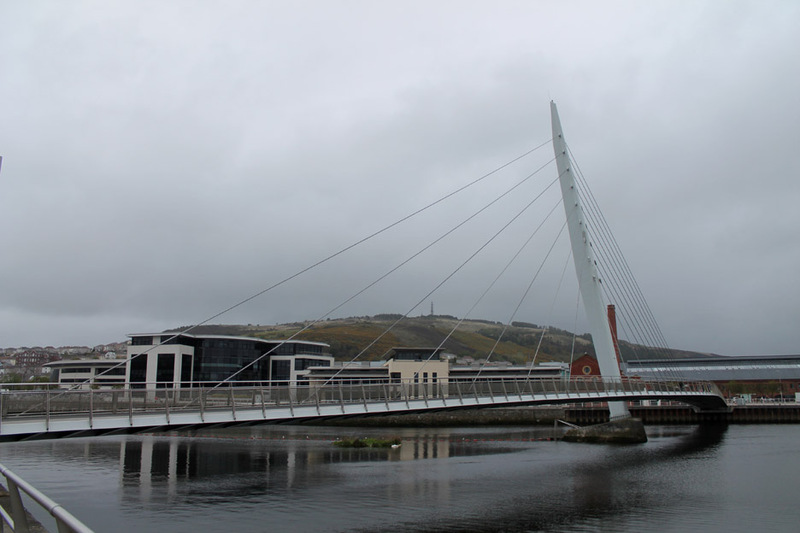 In 2005 they built a second bridge across the river just downstream of the barrage. that sheathed the British fighting ships, made them go faster and enabled them to outpace and out manoeuvre the French in battle. 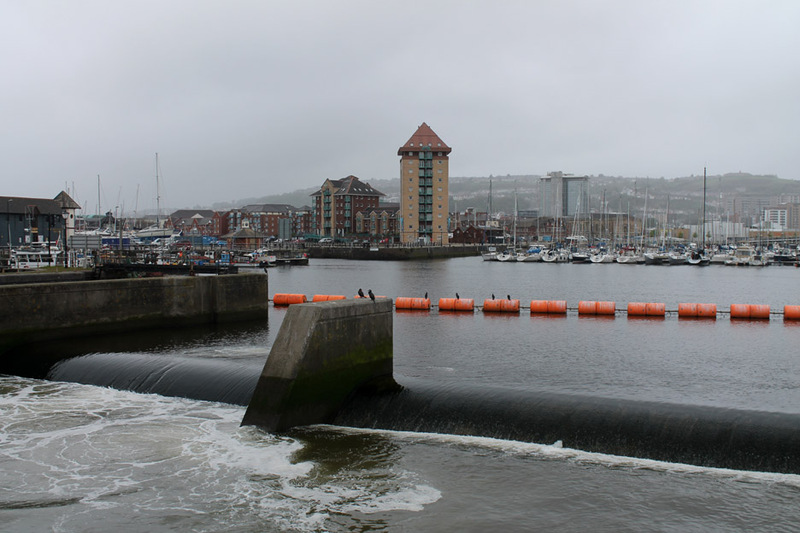 Looking through the railings at the barrage and the moorings. Looking the other way . . . out to sea. Sadly the service was found to be uneconomic and despite a recent attempt at a revival, the latest service also closed in 2011. 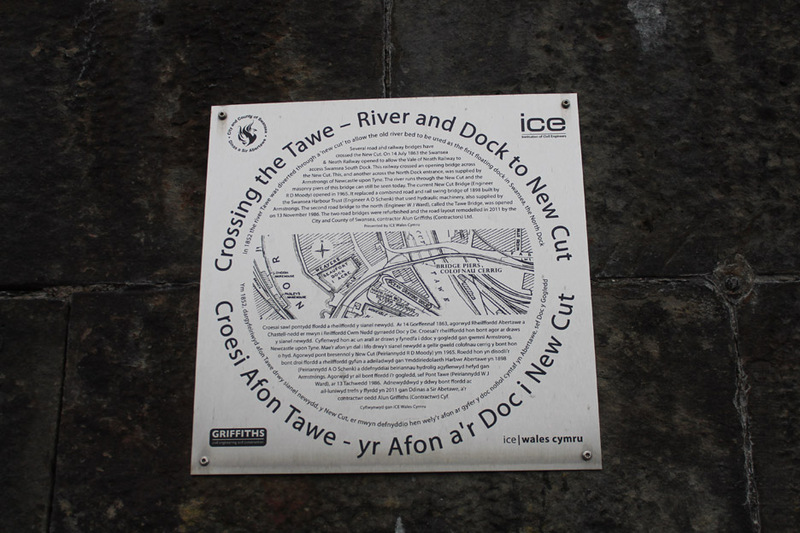 We are now on the east bank of the river, post-coded SA1. 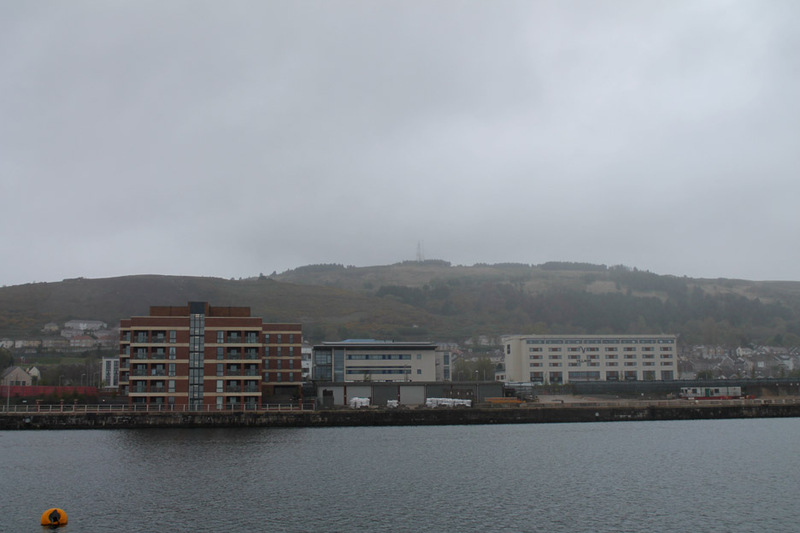 The weather has taken a bit of a dive and the cloud is moving lower over Kilvey Hill, masking the TV mast on the summit. 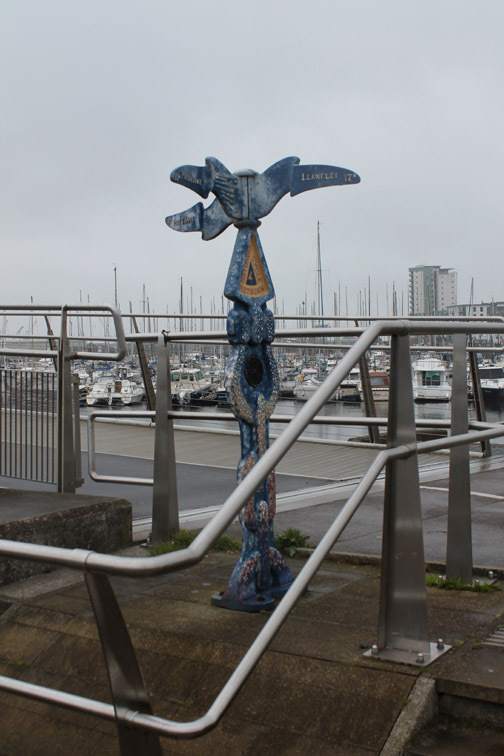 Following the success of The Marina, the city council is now developing this side of the river. 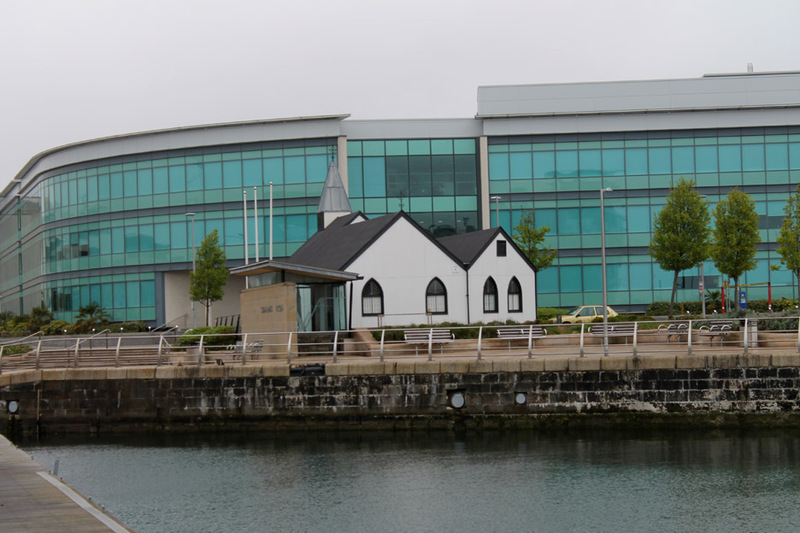 The old Norwegian Church that used to sit next to New Cut Bridge has been physically moved to a new home overlooking the dock. A new porch seems a little out of keeping with the architectural style and it is once again crowded by the new development behind. With a drizzle staring to develop, we find ourselves at the Ice House on this side of the river. Now a bar and grill with an international cuisine it seems. Crossing back over the Sail Bridge this time, we get close up views of the boats. Harry wouldn't walk on the open deck, choosing the tarmac side instead. 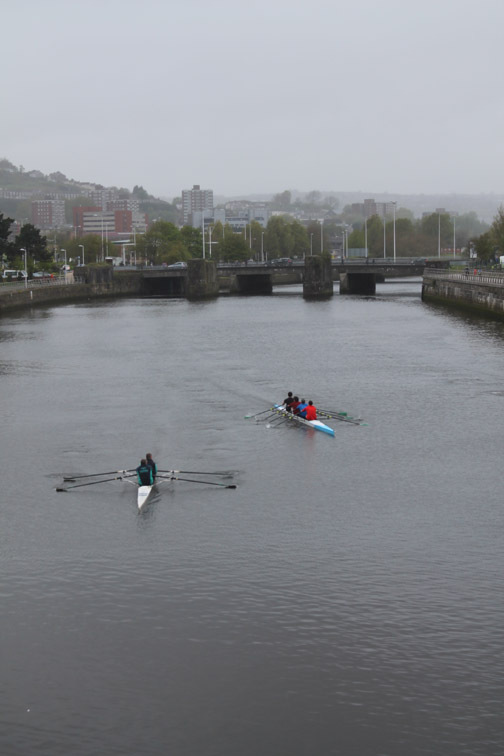 Down below us the Rowing Club are braving the weather. 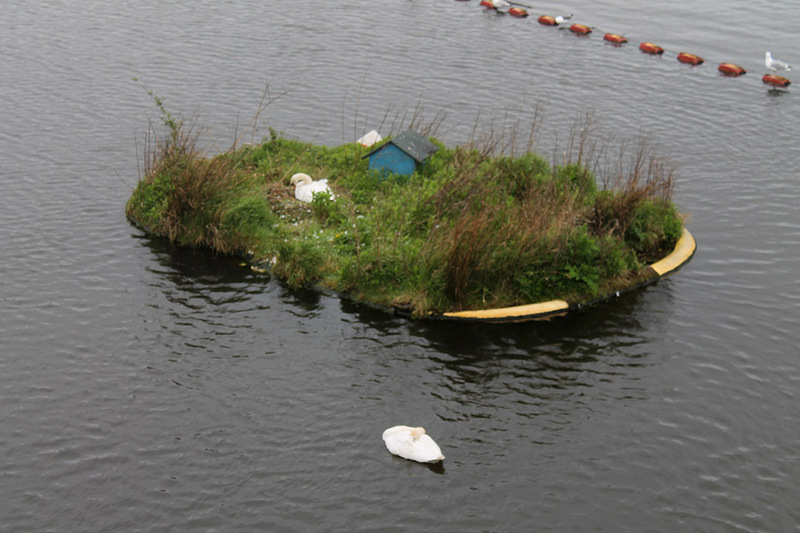 so they've built a floating island which has become home to a number of swans . . . just perfect. The island is protected from the main river by a floating divide. 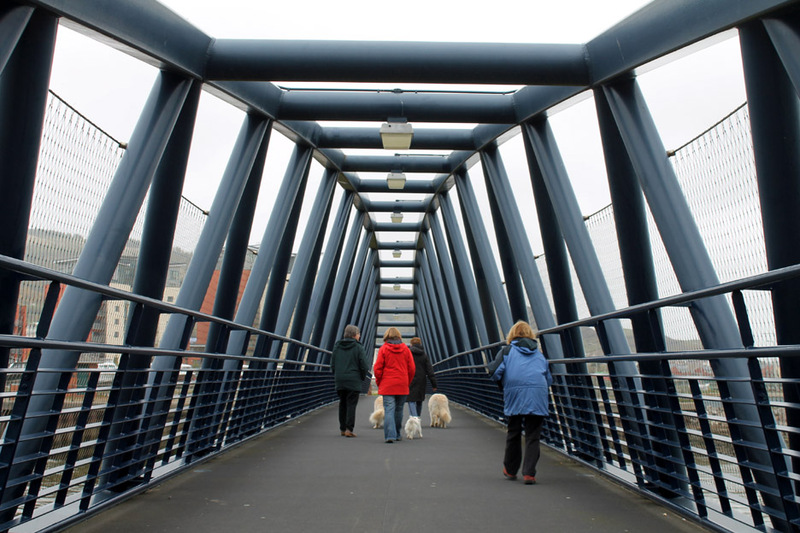 The bridge forms part of the National Cycle Way Network. Finally back at the car we take a look at the statue nearby. 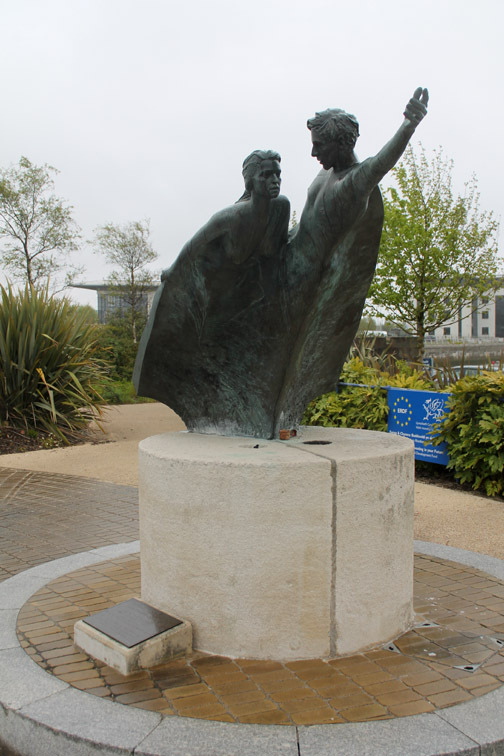 this piece of art is called "Flying Figureheads"
and welcomes visitors to Swansea. on the way into the town centre. 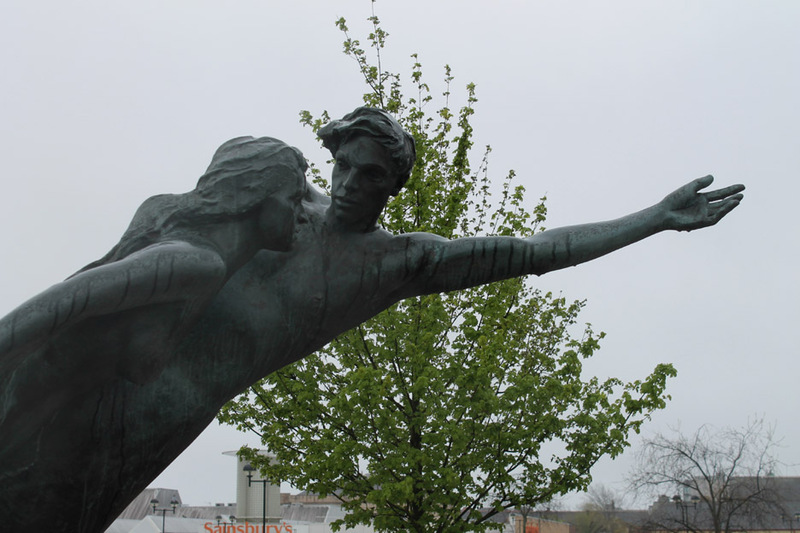 A well deserved win for the sculptor, David Backhouse. In the evening . . . time to chill out and relax over a nice supper. 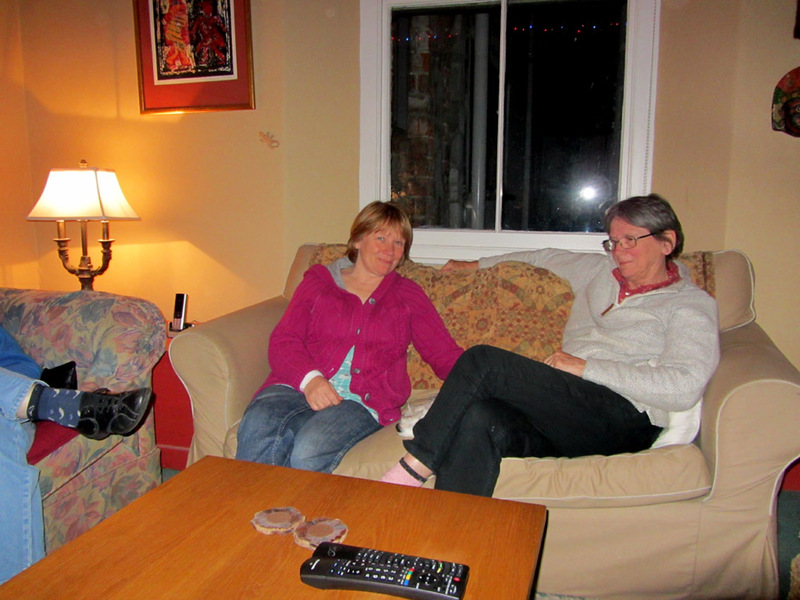 Thanks to Sandra and Jackie for a nice meal . . .
. . . and Gill, seen here on the far end of the settee, who had joined us again tonight. Photographs tonight courtesy of Gareth. Time for bed . . . " Not there Bethan . 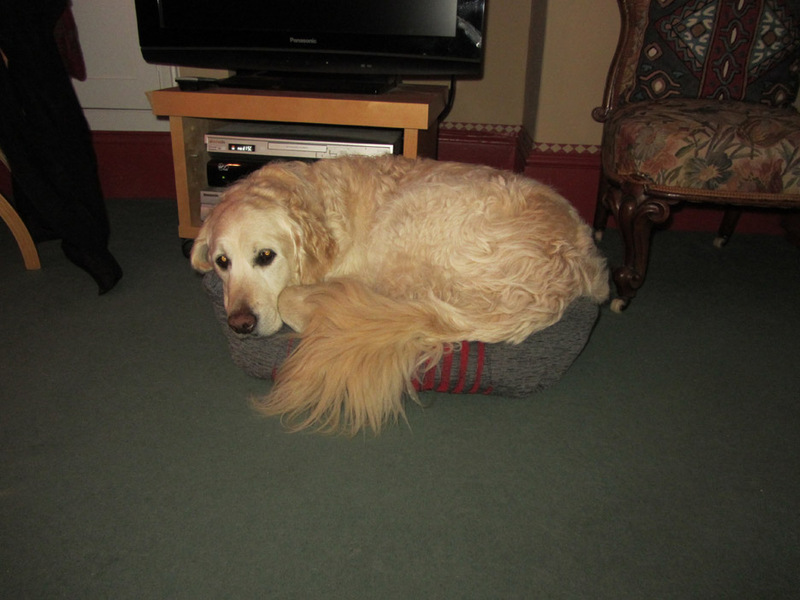 . . you're just too big for Sally's bed." 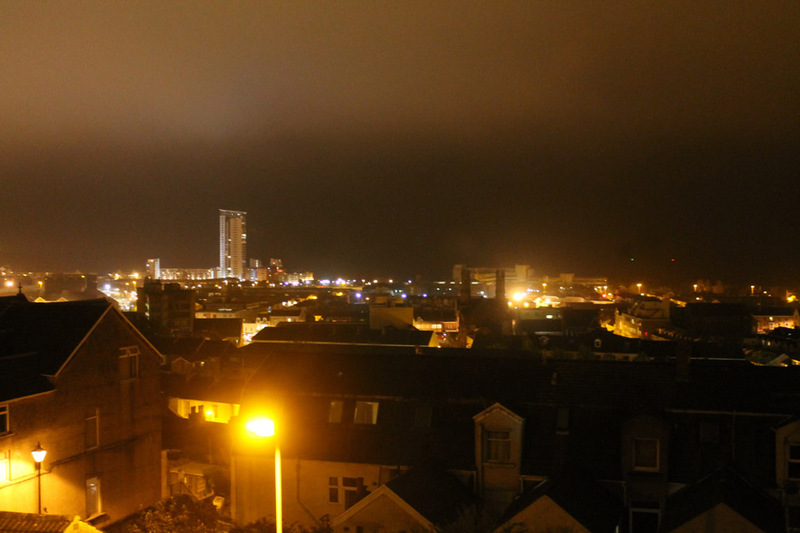 At bedtime for us I felt moved to put my feet out of the window again and this time capture the night time panorama. but the sky is cloudy and long distance views were unclear due to the continuing misty weather. Click here or on the photo above for a larger Loweswatercam 180 degree annotated panorama. Once opened, hold your cursor over the night time panoramic picture to remind you of the view we enjoyed yesterday afternoon. Technical note: Pictures taken with either Ann's Canon Sureshot SX220 or my Canon 1100D Digital SLR. 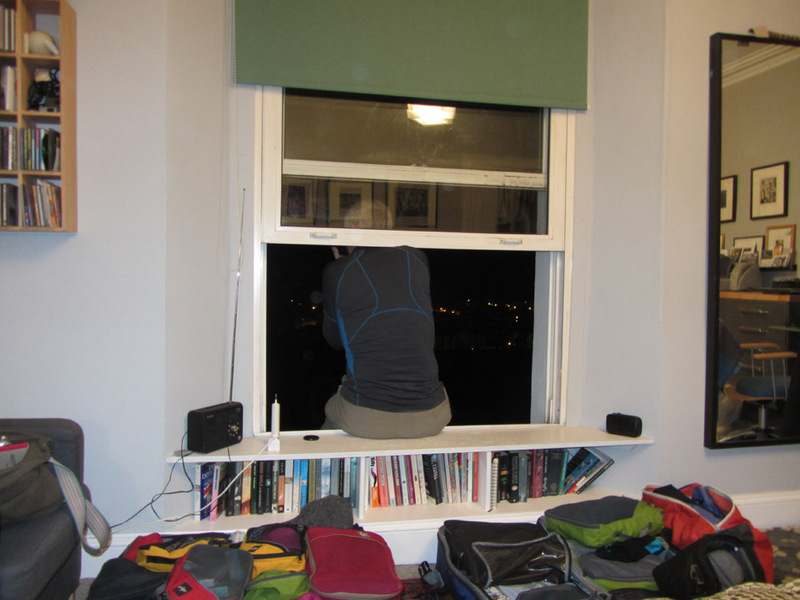 This site best viewed with . . . . a large sash window with a view.